We have a new screen door. No I have not succumbed to pointless (and seemingly ubiquitous) “I’m making coffee!” blog entries. This screen door, like everything else it seems, is directly tied to Annie. When we moved into our house back in 1997, the house had just been refitted with then-new Anderson windows and sliding glass doors. There are two beautiful sliding patio doors in our house; one upstairs in the dining room, and one downstairs in the family room. These sliding doors are our primary means of egress to the deck and back yard, so they are used frequently throughout the day. The doors used to have beautiful wooden panels on the large sheets of glass. A matrix of intersecting decorative wooden strips made the doors look like they were made from 12 small panes of glass. They looked nice until Cozy learned to paw at the door to go out. Cozy eventually destroyed these strips, so for the past five years or so, the doors have been unadorned. Annie would have no doubt destroyed them anyway. At some point in the past, Cozy had torn the screen on the upstairs door. The tear wasn’t large – maybe a few inches, and though ugly, the tear did not greatly affect the screen’s ability to keep bugs out. Then we got Annie. Annie discovered that she could fit her pointy little ferret nose into this opening. She also discovered, that if she pushed, she could make the hole bigger! Bad dog! I like to believe that there is a degree of decorum in my house. There is not of course, but I like to believe there are rules that was as civilized people try to follow. We all follow the unspoken rule that when having nice things, we must not destroy them lest they become ugly – or worse – useless things. Annie is a free spirit, who has no use for rules – especially unspoken ones. One fine day, Annie was trying to get inside. I’m not sure why – zombies in the yard maybe? We do have a bit of a zombie problem here in New Jersey. Whatever the reason, Annie stood at the door, woofed her little ferret woof, and becoming impatient with our inaction, pushed her nose onto the screen as dogs often do. Annie is no ordinary dog though. Annie the ferret-dog pushed her nose into the hole just as I walked up. “Annie NO!” I yelled as I ran up to stop her. Feeling panicked, she did what any crazed 100 pound puppy-ferret would do; she pushed. I couldn’t get there in time. I tried – I swear that I tried. I can vividly remember the sound. The awful sound of tearing screen fabric as Annie’s black and white nose with that cute patch of white came pushing through the tear. As if watching a demonic birth, the head came next. It was horrifying! The closer I got to the wicked beast, the more agitated she got. Being fully committed she had made her choice. 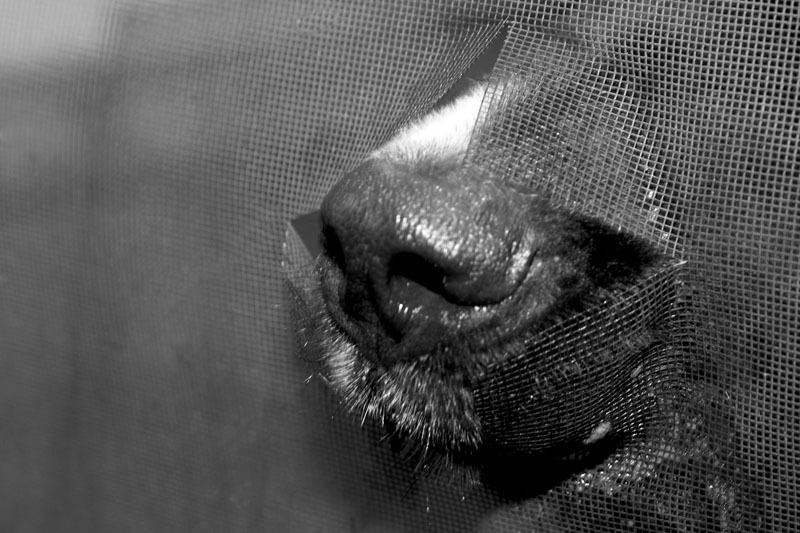 In one final push, 100 pounds of black and white mayhem came through the screen. What had been a three inch hole was now a tear that my eight-year-old could walk through. Annie, now inside, wisely ran to hide behind Lauren. In the stunned silence, all that could be heard was mumbled obscenities while I stood and stared at the wrecked door. Guinness, having been out on the deck watching, waited for the excitement to end. As if nothing had happened, he got up, and walked through the new opening that Annie had so thoughtfully provided. Yesterday, I bought a new sliding screen door for the kitchen. Are there any bets as to how long it will last? Loved your story!!! I’m still laughing:) We have a 1year old Newf, who is a monster, and he did the same thing! Now all the dogs just walk right through the giant hole. It’s so great to hear that other people deal with the same things….oh the joy of owning a newf:) Thanks for the laugh! Our Newf, Toby, ruined our screen door twice. The first time he pushed through it, we dutifully bought new screening and re-screened that slider and then tried very hard to keep him from running through it. Well, a squirrel in the backyard motivated our 165 pound Toby to GALLOP through the screen. After that, well, we just left it hanging in shreds. What was the point? At least this way, when that back slider door was open in warm weather he could go in and out as he pleased!